The Iranian government has blocked access to the social networking site Facebook amid political jockeying for the June 12 presidential elections, according to the semi-official Iranian Labour News Agency. Reformist candidate Mir Hossein Mousavi — a former prime minister considered a threat to current hardline President Mahmoud Ahmadinejad — created a Facebook page for his campaign that has more than 5,000 supporters on the site. Those attempting to visit Facebook received a message in Farsi saying, “Access to this site is not possible,” according to CNN personnel in Tehran. ILNA reported the Masadiq Committee, made up of representatives from Iran’s intelligence ministry, judiciary and others had ordered the action. After a few hours, the blockage was lifted, but was then reinstated, ILNA said. No reason was given for the block. “We are disappointed to learn of reports that users in Iran may not have access to Facebook, especially at a time when voters are turning to the Internet as a source of information about election candidates and their positions,” a Facebook spokesperson said in a statement. Journalist who was jailed by Iran returns to U.S.
“We believe that people around the world should be able to use Facebook to communicate and share information with their friends, family and co-workers. It is always a shame when a country’s cultural and political concerns lead to limits being placed on the opportunity for sharing and expression that the Internet provides.” Ahmadinejad’s challengers are increasingly turning to new technology to spread their message, according to a May 13 article in the Financial Times newspaper. Iran’s population — estimated at more than 66 million by July 2009, according to the CIA World Factbook — has a median age of 27. The Financial Times, which put the country’s population at 70 million, said 47 million Iranians have cell phones and 21 million have Internet access. “We are using new technologies because they have the capacity to be multiplied by people themselves who can forward Bluetooth, e-mails and text messages and invite more supporters on Facebook,” Behzad Mortazavi, head of Mousavi’s campaign committee, told the Financial Times. 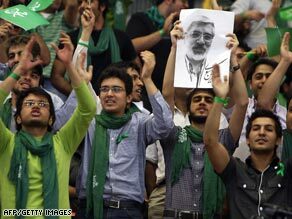 At a Mousavi rally at a stadium Saturday, the Facebook blockage was a topic of conversation among reporters. Many said they had accessed Facebook on Friday night and believe the site was blocked Saturday morning.